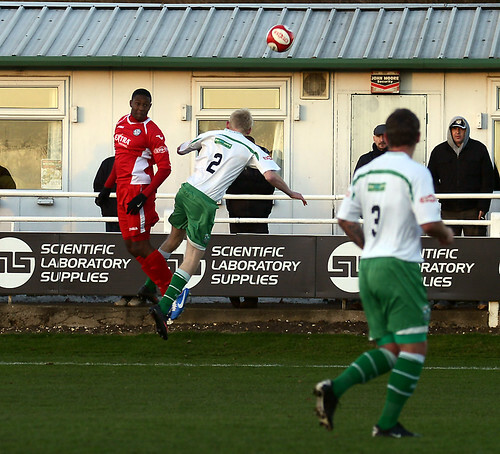 A last minute winner by Aaron Rey sensationally ended North Ferriby United’s sixteen match unbeaten league run as a late Hednesford Town comeback confirmed The Pitmen as real title challengers. The Pitmen showed immense character and heart to twice reverse a goal deficit in the second half as the pendulum swung from one team to the other in an absorbing clash at the summit of the Evo-Stik Northern Premier Division. 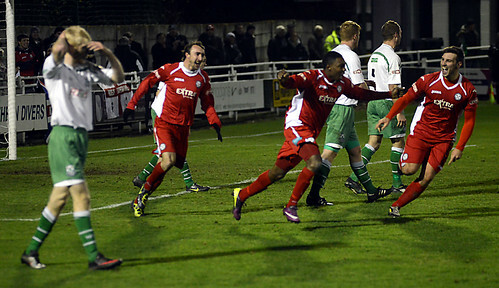 North Ferriby looked lively in attack and Dan Crane was called upon twice in the space of two minutes when he first blocked Anthony Wilson’s back post header and then, at full stretch, superbly palmed another Wilson header away on 12 minutes. 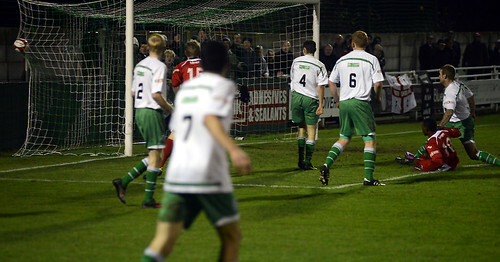 Just seven minutes later Wilson’s strike partner Ryan Kendall hit the crossbar with a stooping header as Ferriby continued to threaten to take the lead but Hednesford battled extremely hard to repel North Ferriby with Ben Bailey and the outstanding Francis seemingly immovable in the centre of defence. Jamey Osborne showed the perfect indication of his team’s fighting spirit as he a chased down a seemingly lost cause in the corner, dispossessed Dean Lisles and curled a low shot at Adam Nicklin. 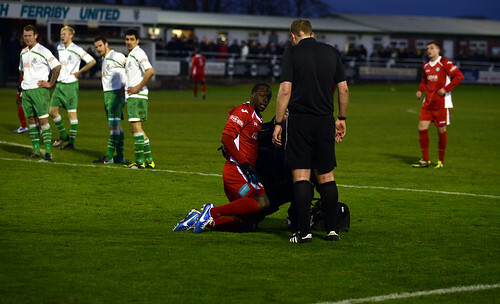 As both sets of supporters mulled over what was a relatively even first half no one in the Rapid Solicitors Stadium could envisage the drama that was to follow in the second half as North Ferriby took the lead through Danny Clarke on 48 minutes. 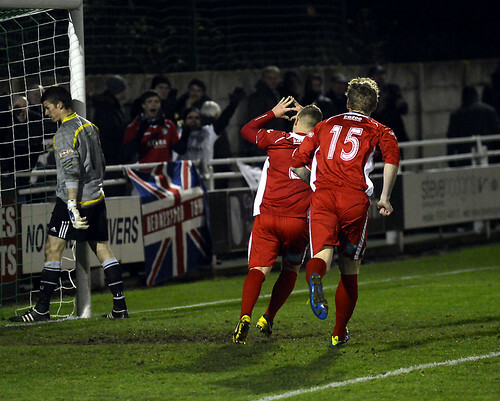 The Pitmen were given the opportunity to level on 54 minutes when Neil Harvey ran into the penalty area and Nicklin came rushing out in an attempt to reach the ball but almost decapitated the striker in the process. 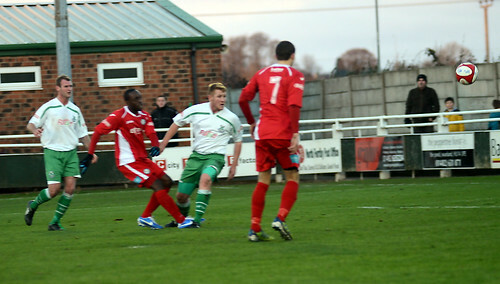 Astonishingly there was no booking for the goalkeeper but he could do nothing to stop Durrell converting from the spot. The equaliser galvanised the away side and, spurred on by their once again vociferous away support, Hednesford could have taken the lead on no less than three occasions but for some inspired goalkeeping matched only by Crane as he twice also denied North Ferriby in an end to end match. Nicklin brilliantly tipped Rey’s deflected shot onto the bar on 54 minutes and stretched to keep out a header, again from Rey on 69 minutes but the goalkeeper’s saves perhaps earned some luck when Neil Harvey’s shot cannoned back off his face and clear. Wilson found the net for his second goal from a Liam King corner with 10 minutes remaining and the sucker punch looked to have flattened The Pitmen’s chance but Francis was felled in the area, the referee pointed to the spot and Durrell levelled the scores. With The Pitmen set up to chase an equaliser they incredibly won the match in the 89th minute when Francis crossed perfectly for Rey to power a header beyond Nicklin. 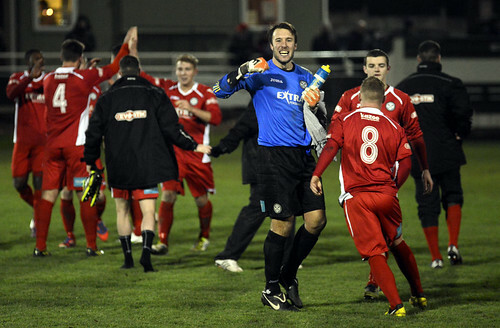 Crane still had to make another superb save from Nathan Pleat’s late free kick but the final whistle prompted frenzied celebrations on the pitch and in the stands as Hednesford Town roared with self-assurance, confidence and a brilliantly earned three points. Those photo's are superb! UTP!